The possibility of placing public art in the roundabout at Chemawa Road Northeast and Verda Lane Northeast took a giant leap forward at the Keizer City Council meeting Monday, Feb. 6. 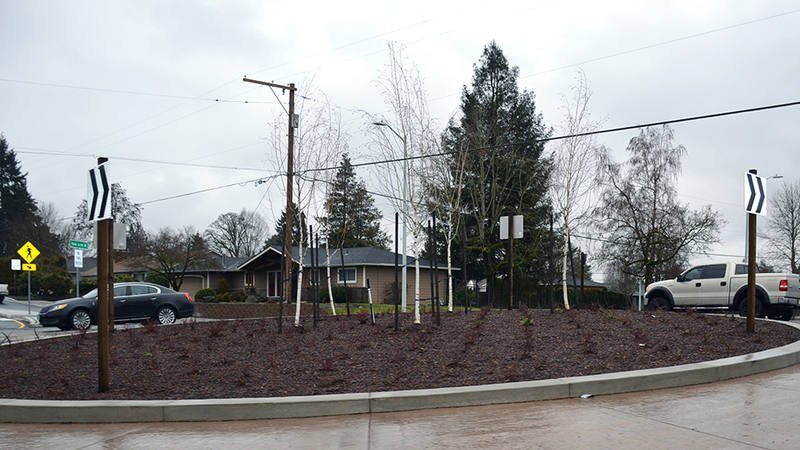 The city council approved the placement of a public art pad in the roundabout, at the request of the Keizer Public Art Commission (KPAC), with a 6-0 vote. Councilor Kim Freeman was absent. While there were some reservations on the council, Mayor Cathy Clark was most vocal. “I have tremendous concerns with the functionality given that this roundabout is on an angle. It relieved a tremendous bottleneck and created safety. I have reservations about putting anything there that could compromise the function,” Clark said. Earlier in the evening, Lore Christopher, a former mayor and current member of KPAC, addressed the issue with the council and suggested that the council would have final say over what goes on the site and the design, but that turned out not to be true. “One of the reasons we created the commission was so the council would not take on the role of art critic,” said City Attorney Shannon Johnson. Current KPAC plans call for a cow-themed art piece, an homage to the nearby cows that will likely be replaced by apartments, but there is no funding for the project yet. “What we are asking is for the council to approve the site so we can begin looking for grant money to fund it,” Christopher said. Community Development Director Nate Brown said that while he understood the concerns about the roundabout functions, the addition of public art might deter some bad behavior. “People can go through at a rapid rate of speed and if we re-channel that visibility it may provide a benefit,” Brown said.